The performance of our SCB product range matches that of conventional plaster of Paris and fiberglass products, but yet surpasses these modalities in functionality, patient satisfaction and hygiene. With FastForm®, you can treat your patients cost effectively, with our ultra mouldable products that provide a perfect fit and superior comfort from injury to recovery. The FastForm® Hand-based Thumb Spica Orthosis (HTSO) has revolutionised the treatment of short arm fractures and tissue traumas. The HTSO is quick, easy and clean to apply. After activation by heat, the HTSO is designed to mould perfectly to the patient’s body contours. In addition, its inner surface is layered with DermaWick®; a special fabric liner that wicks away moisture from the skin. A superior alternative to conventional casting material and non-custom mouldable orthoses, the FastForm® HTSO allows patients the freedom to swim, shower and carry out daily activities with greater ease and comfort. Patients will love how the enhanced comfort of FastForm® improves their healing experience and quality of life. The Hand-based Thumb Spica Orthosis (HTSO) can be used for the treatment of ulnar collateral ligament injuries and provides stabilization and immobilization of the first metacarpophalangeal (1st MCP) joint and may be used preoperative, postoperative or post-trauma. Disclaimer: The codes listed show possible coding options and are for information purposes only. FastForm® Medical does not represent, promise, or guarantee levels of reimbursement, payment, calculations, patient eligibility or charges. Ultra Moldability. Thanks to our highly moldable PolyTrexX® polymer which has zero memory, the HTSO molds faithfully to fit limb contours and can be applied with ease to maximise positioning and alignment. Aerated, water-resistant and fully breathable. Ultra comfort without itch and odor; patients can shower and swim. Integrated DermaWick® liner means there is no need for cast padding. 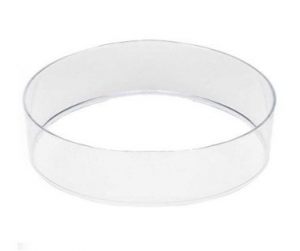 Perfect fit; strong but light-weight and re-moldable. A custom fit is quick, easy and hygienic to achieve without fumes or dust. Volumetric adjustability. Compensates for swelling or muscle atrophy throughout the healing process, making it ideal for susceptible patients, sports, active people and authorized air travel. Single piece medical product-Flat packed. Minimal SKU categories and only two sizes required, thanks to stretch and trim features. Saves space and keeps inventory requirements to a minimum. The HTSO is a stretchable single piece flat packed medical product for either Left or Right hands meaning only two sizes are required thus minimising inventory levels and storage space requirements. Please contact our local distributor in your area for prices and delivery details. Alternatively, please send us an email to info@fastformmedical.com and we will connect you to the nearest distributor in your area who will follow up directly with you. Tension Straps are used on FastForm® orthoses to maintain a snug secure fit and are adjustable to compensate for swelling or atrophy. deter and indicate unauthorized removal of the strap and orthosis. To retain and secure FastForm® orthoses such as: SAMOs. TSMOs and UGMOs. 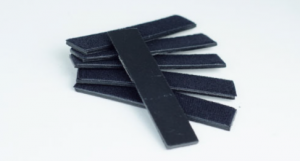 Moldable PolyTrexX® strips with Velour on one side. The FastForm® VERSI™ Strip is a general purpose low temperature thermoplastic strip that is trimable and moldable and is used to easily adapt and augment our existing product range to suit individual patients. Extension of Thumb Spicas., repairs, re-enforcement, joining, locking, finger splints etc. The Infrared oven is suitable for heating FastForm® products. Infra red oven with digital timer and Power control. (110v and 230v models available). 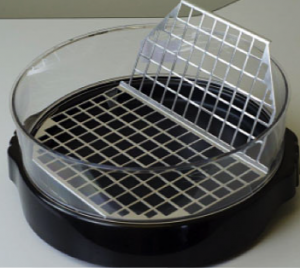 Comes complete with a 3″ (75mm) Extender ring and Oven Waffle Rack. Used in conjunction with Infrared Oven (Cat# 9801) to heat FastForm® products. Used to reheat previously formed FastForm® upper extremity orthosis. 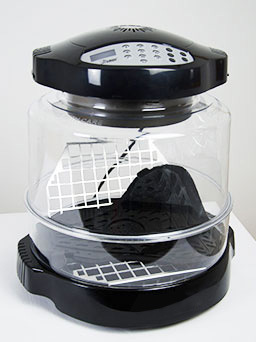 Rack used to support FastForm® products while being heated in an Infrared Oven. Products to suit individual patients. quick, easy and clean to apply. hinge that can be utilized if desired to make devices that are easy to remove and refit on patient’s limbs and digits. superior alternative to conventional casting material and non-custom moldable orthoses. fabrication of custom molded rigid splints, orthoses and adaptive equipment. Complex, compound and/or comminuted fractures, Load bearing applications. Orthopedic orthosis, external immobilization devices and rehabilitation aids. FastForm®‘s VERSI™ Sheets are made from a low-temperature thermoplastic material (PolyTrexX®) and are activated by heating at a temperature of 75°C (167°F) to 85°C (185°F) for 3-5minutes, ideally in our Infrared heater (Cat # 9801 for 110v version or Cat # 9813 for 220-240V version) or in a splint pan while still sealed in its pouch. Ultra Moldability. Thanks to our highly moldable PolyTrexX® polymer which has zero memory and requires low temperature for activation, FastForm® VERSI™ Sheets mold faithfully to fit limb contours due to its excellent drape properties and remains rigid and stable after cooling. The material can be easily stretched to maximize sizing, positioning and alignment. Sizing and shaping. Multiple trim lines are incorporated for easy trimming options. Bond-Ability. FastForm® VERSI™ Sheets are coated to reduce accidental self-bonding, but can be easily welded to itself or other FastForm® products (on locally de-coated surfaces) after the coating has been removed by pressing and bonding the two surfaces together. Padded Edges. Simply fold over the edge so that the PolyTrexX® bonds to itself to create a padded comfort edge. Aerated, water-resistant and fully breathable. Ultra comfort with reduced itch and odor; patients can shower and swim if authorised by their physician. Integrated DermaWick® liner means there may be no need for additional cast padding. The highly open mesh-like structure provides superior ventilation for comfort while maintaining strength and lightness. Perfect fit; strong but light-weight and re-moldable. A custom fit is quick, easy and clean to achieve without fumes or dust. To remold, simply reheat and reshape as needed. Volumetric adjustability. When fabricated into a circumferential cast, splint or brace, the integrated hinge may be useful to facilitate easy on/off applications. This is useful for rehab or to make adjustments to compensate for swelling or muscle atrophy throughout the healing process, making it ideal for susceptible patients, sports, active people and authorized air travel. Radiolucent and 85% biodegradable. No need to remove devices made from FastForm® VERSI™ Sheets for follow-up X-Ray examinations. FastForm®‘s PolyTrexX® polymer is also environmentally friendly. With FastForm®, you can treat your patients cost effectively, with our ultra moldable products that provide a perfect fit and superior comfort from injury to recovery. The FastForm® Universal Gutter Multifunctional Orthosis (UGMO) is revolutionizing the treatment of meta carpal and phalangeal fractures and tissue traumas. The UGMO can be used as a splint, cast or brace and is quick, easy and clean to apply. FastForm®’ s revolutionary technology is based on a highly conformable thermoplastic (PolyTrexX®) combined with an effective wicking and fast-dry liner (DermaWick®). When heated, PolyTrexX® is highly conformable (plaster–like). Once molded to the desired position and shape, PolyTrexX® rapidly reverts to a high strength, ventilated immobilizer that’s radiolucent. 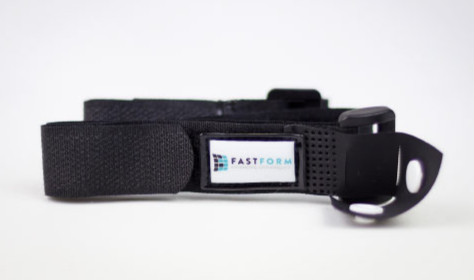 The FastForm® UGMO uses the same technology used in its SAMO orthosis which in a study was shown to produce effective fracture immobilization and acceptable radiological outcomes.1 The adjustability and easy removal may suit a wider spectrum of patients. The Universal Gutter Multifunctional Orthosis overlapping design and tension strap allows for either pressure relief from swelling or soft-tissue compression to increase limb stiffness. Built-in hinges (easy on/off) enhance patient comfort and routine hygiene, while the compliance-lock deters tampering. 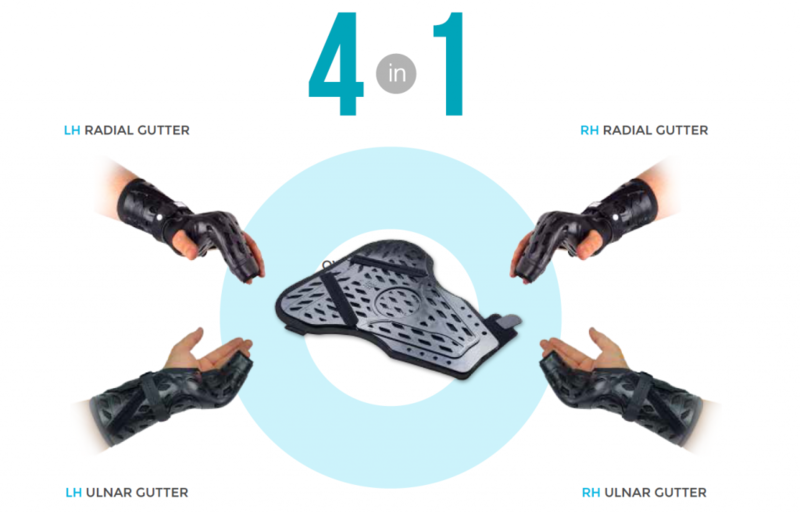 Inventory is reduced as a single UGMO can be used as an Ulnar or Radial Gutter for both RH and LH applications. (4 in 1 design). A superior alternative to conventional casting material and non-custom moldable orthoses, the FastForm® UGMO allows patients the freedom to carry out daily activities with greater ease and comfort. Patients will love how the enhanced comfort of FastForm® improves their healing experience and quality of life. Treatment of minimally-displaced fractures of the metacarpals, sprains and strains, tendonitis and other cumulative trauma injuries. Pain management, and post operative support and protection. Complex, compound and/or comminuted fractures. Disclaimer: The codes listed show possible coding options and are for information purposes only. FastForm<sup>&reg;</sup> Medical does not represent, promise, or guarantee levels of reimbursement, payment, calculations, patient eligibility or charges. Ultra Moldability. Thanks to our highly moldable PolyTrexX® polymer which has zero memory, the UGMO molds faithfully to fit limb contours. Focal compression can be applied with ease to maximize positioning and alignment. Aerated, water-resistant and fully breathable. Ultra comfort with reduced itch and odor; patients can shower and swim (as per guidelines outlined in the IFU and Patient’s Instructions leaflet). Integrated DermaWick® liner means there is no need for cast padding. Perfect fit; strong but light-weight and re-moldable. A custom fit is quick, easy and clean to achieve without fumes or dust. Radiolucent and 85% biodegradable. Reduced need to remove the UGMO for follow-up X-Ray examinations. FastForm<sup>&reg;</sup>’s PolyTrexX® polymer is also environmentally friendly. Secure Fit throughout healing. Compliance lock strap deters unauthorized removal. No cast saw required for removal once healing is complete. Rehabilitation use. Two integrated hinges allow the UGMO to be converted into a wearable rehab splint for continued support. Single piece, 4 in 1 medical product-Flat packed. Minimal SKU categories required due to 4 in 1 design. Saves space and keeps inventory requirements and management to a minimum. With FastForm®, you can treat your patients cost effectively, with our highly moldable products that provide a perfect fit and superior comfort from injury to recovery. The FastForm® Thumb Spica Multifunctional Orthosis (TSMO) is revolutionizing the treatment of thumb and wrist related fractures and tissue traumas. The TSMO can be used as a splint, cast or brace and is quick, easy and clean to apply. 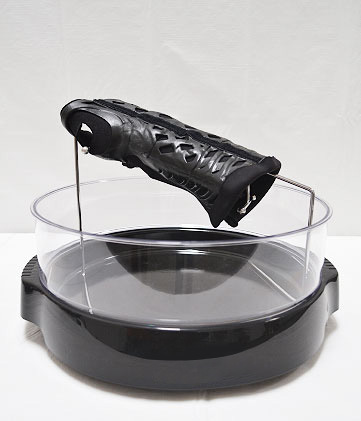 After activation by heat, the TSMO is designed to mold perfectly to the contours of the patient’s limb. In addition, its inner surface is layered with DermaWick®; a special comfort fabric liner that wicks away moisture from the skin. A superior alternative to conventional casting material and non-custom moldable orthoses, the FastForm® TSMO allows patients freedom to swim, shower and carry out daily activities with greater ease and comfort. Your patients will love how the enhanced comfort of FastForm® improves their healing experience and quality of life. The FastForm® TSMO is an effective and comfortable solution for the treatment of scaphoid fractures and provides primary stabilization for the first metacarpophalangeal (MCP) joint and first carpometacarpal (CMC) joints, as well as secondary support for the radiocarpal and radioulnar wrist joints. The TSMO can also be used for a variety of injuries; stabilization of simple wrist fractures, sprains and strains, tendonitis, cumulative trauma injuries, pain management, and post operative support and protection. •• L3807 Wrist hand finger orthosis, without joint(s), prefabricated item that has been trimmed, bent, molded, assembled or otherwise customized to fit a specific patient by an individual epertiese. swim. Integrated DermaWick® liner means there is no need for cast padding. making it ideal for susceptible patients, sports medicine, active people and authorized air travel. removal once healing is complete. stretch and trim features. Saves space and keeps inventory requirements and management to a minimum. distributor in your area who will follow up directly with you. With FastForm®, you can treat your patients cost effectively, with our ultra moldable products that provide a perfect fit and superior comfort from injury to recovery. The FastForm® Short Arm Multifunctional Orthosis (SAMO) is revolutionizing the treatment of short arm fractures and tissue traumas. The SAMO can be used as a splint, cast or brace and is quick, easy and clean to apply. After activation by heat, the SAMO is designed to mold perfectly to the patient’s body contours. In addition, its inner surface is layered with DermaWick®; a special fabric liner that wicks away moisture from the skin. A superior alternative to conventional casting material and non-custom moldable orthoses, the FastForm® SAMO allows patients the freedom to swim, shower and carry out daily activities with greater ease and comfort. Your patients will love how the enhanced comfort of FastForm® improves their healing experience and quality of life. Use the FastForm® SAMO for a variety of injuries; stabilization of simple wrist fractures, sprains and strains, tendonitis, cumulative trauma injuries, pain management, and post operative support and protection. •• L3807 Wrist hand finger orthosis, without joint(s), prefabricated item that has been trimmed, bent, molded, assembled, or otherwise customized to fit a specific patient by an individual with expertise. Ultra Moldability. Thanks to our highly moldable PolyTrexX® polymer which has zero memory, the SAMO molds faithfully to fit limb contours. Focal compression can be applied with ease to maximize positioning and alignment. Aerated, water-resistant and fully breathable. Ultra comfort with reduced itch and odor; patients can shower and swim. Integrated DermaWick® liner means there is no need for cast padding. Radiolucent and 85% biodegradable. No need to remove the SAMO for follow-up X-Ray examinations. FastForm’s PolyTrexX® polymer is also environmentally friendly. Rehabilitation use. An integrated hinge allows the SAMO to be converted into a wearable rehab splint for continued support. Single piece medical product-Flat packed. Minimal SKU categories and only three sizes required, thanks to stretch and trim features. Saves space and keeps inventory requirements and management to a minimum.